On November 23, our supporters in Sheffield will be gathering to say: migrants are welcome! Theresa May is trying to save her disastrous and unpopular Brexit deal by playing the xenophobia card. In a recent speech, she accused EU nationals of “jumping the queue” in front of “engineers from Sydney or software developers from Delhi.” But we know it’s not European migrants stopping non-EU migration – it’s the UK government, with its arbitrary restrictions and hostile environment policies. Ending freedom of movement would mean a huge loss of rights for millions of EU citizens, whose work and family lives will be made much harder. It’s also a huge loss of rights for UK citizens who want to travel, live, work and raise families abroad. Any steps to create a more “hostile environment” for foreigners will lead to more scandals like Windrush, which shamed the whole country. It will hurt the NHS, which relies on the skills and tireless work of people from around the world. It will make Britain and Europe a more walled-off, small-minded place, poorer in every sense of the word. 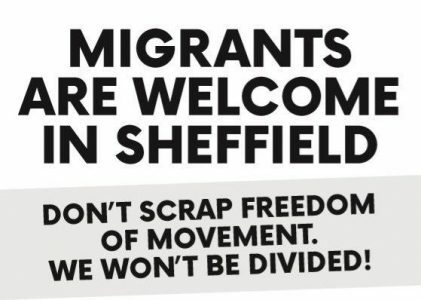 On Friday November 23, our local group Sheffield Left Against Brexit, alongside the Labour Campaign for Free Movement, South Yorkshire Migrant and Asylum Action Group and others will rally outside Sheffield Town Hall from 5 to 7:30pm to refuse the anti-migrant agenda, and say: hands off freedom of movement; migrants are welcome here.